From 10th to 12th February, the FINESCE-team attended the E-World energy & water 2015 to present the opportunities of the FINESCE platform for smart energy application development. 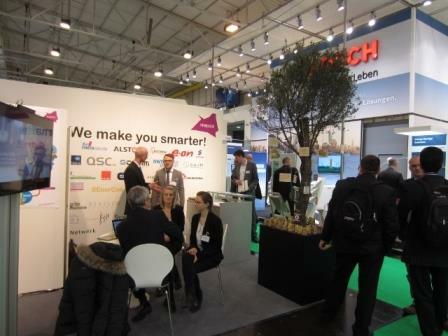 At the Eworld, over 600 exhibitors presented their ideas and shared their experience with projects revolving around the topic of smart energy. Over 24.000 trade visitors were present this year. 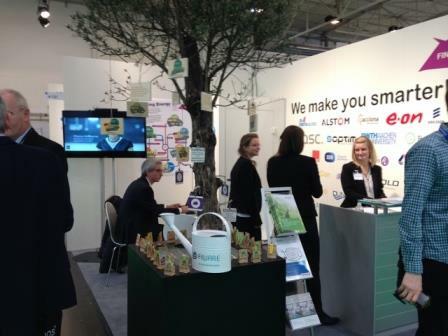 The FINESCE booth at the exhibition offered visitors an insight to FINESCE in the FIWARE ecosystem – represented by a large tree with the trial sites at the base of the tree and between the roots, the generic enablers lining the trunk and successfully implemented example applications as the fruits. The FINESCE booth also presented an opportunity to introduce visitors to a shared European ICT platform for developing and testing Smart Energy applications and the development of European hard- and software standards that the project is currently implementing. The platform, especially its innovative character and the possibility to test apps with real data from the trial sites were well received. 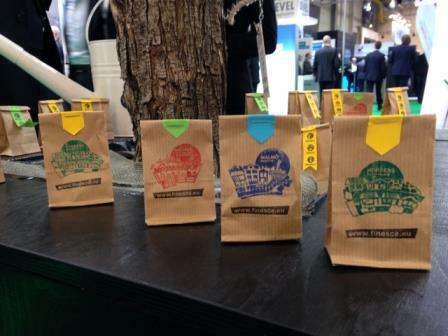 The trial sites – such as the smart factory in Aachen, the smart office building in Madrid or the smart city in Malmö were presented along with the possibilities to use their data to test new implementations. Future opportunities for the platform as well as the advantages and possibilities for an industry driven community revolving around the platform were discussed and many interesting and fruitful conversations arose.